Brazil is the largest and most populated country in Latin America, with a total area of 3,265,080 square miles and a population of more than 207 million people2 (it is the fifth-largest country in the world with regards to size and population). Brazil is a federation divided into 26 states, one Federal District and 5,570 municipalities. Since 2012, owing to the depreciation of the real against the US dollar and the economic recession that began in 2015, Brazil’s GDP has decreased and the country is now the world’s ninth-largest economy,3 having formerly been the sixth-largest in 2011. Almost all gambling activities have been prohibited in Brazil for over 70 years. Since the general ban on games of chance in 1941, the only legal gambling activities are the lotteries under the state monopoly, and horse race wagering. According to Brazilian law, poker is a game of skill and is therefore not illegal. With the economic turmoil, it has been said that gambling regulation (and taxation) may help the government raise revenues. Two bills of law are currently under discussion in the Congress, but this year’s presidential election may slow down the final decision on the matter. LOTEX, the instant lottery, is expected to be privatised in 2018. Gambling, in general, is not regulated in Brazil. In fact, since the 1940s, Brazil has been a closed market for gambling, with only state-owned lotteries and horse race wagering. For a brief period in the 1990s, bingos and slot machines were permitted, but they were banned in the mid-2000s. As a consequence, Brazil’s gambling regulation is still incipient. ‘Game’ is a contract type expressly nominated, but not defined, by the Brazilian Civil Code. Its definition is provided by jurisprudence. Luiz da Cunha Gonçalves4 defines a game contract as ‘a commitment, agreed as for hobby or as for desire for money, between two or more individuals, in which each player agrees to pay a certain sum of cash or something else to the other party(ies) if he/she loses, based on some future event, which implementation depends, at least in part, on the activity of the players’. In fact, the contract game can be defined as a legal transaction whereby two or more people hold a particular promise (usually with pecuniary content) in favour of the person who achieves a favourable result in the performance of an act in which everyone participates. Note that the game (and thus the success or failure of each party) necessarily depends on the performance of each party (called a player), either by his intelligence, or by his skill, strength, or simply luck. The bet contract, in its turn, is a legal transaction in which two or more people with different opinions on a certain event, promise to perform a particular action (in general, with monetary content) to the benefit of the party whose opinion prevails. Hence, in the bet, there is not the requirement for the active participation of each party (called a bettor) to influence the outcome of the event, but rather only the expression of her/his personal opinion. The difference between a ‘game’ and a ‘bet’ is that the result of a ‘game’ will depend on the action of the parties, while the result of a ‘bet’ depends on facts unrelated to the parties’ will. It is important to highlight that these definitions have been created by jurisprudence and are not expressly set forth by law, although they are widely accepted and applied by the courts. c bets on any other sport competition. d an establishment intended for the operation of games of chance, even if its purpose is disguised. Contrary to this, ‘games of skill’ are those whose results depend on ability of the player, more than on luck. These are legal. ‘Lotteries’ are defined by Article 51 of the Misdemeanour Law as the operation of payment of prizes depending on the result of the draw of tickets, lists, coupons, vouchers, signs, symbols or similar means. Article 51 of the Law prohibits the operation or promotion of unauthorised lottery games in Brazil, including the distribution of foreign lottery tickets in the country. The Brazilian numbers game Jogo do Bicho (‘the animal game’), which is similar to a lottery, is also prohibited. Horse race betting is regulated by Law No. 7,291 enacted on 19 December 1984 and its 1988 regulation, Decree No. 96,993.
a Ordinance MF 422 of 18 July 2013 establishes the cases in which contests are not deemed as exclusively artistic, cultural, sportive or recreational for free prizes or awards distribution purposes. b Ordinance MF No. 41 of 19 February 2008 regulates the free distribution of prizes for advertisement purposes, when performed by raffle, gift certificates, contests or similar operations. a Raffle: raffling elements are distributed, numbered in series, and those to be awarded are defined based on the results of the extraction of the Federal Lottery or on a combination of numbers from such results. b Gift certificates: gift certificates are randomly hidden inside a product or the product’s respective package. The gift certificate will be exchangeable for the prizes in the exchange stations. c Contests: contests are based on forecasts, calculations, intelligence testing, games of skill or competitions of any nature. d Similar operation: type conceived from combination of factors suitable to each one of the other types of prize promotion, preserving the original concepts for qualifying competitors and verifying the winners. It may be presented as ‘Similar to Contest’, ‘Similar to Gift Certificate’ and ‘Similar to Raffle’. Contests for advertising purposes must be authorised by the Ministry of Finance, either by Caixa Econômica Federal (Caixa), Brazil’s largest state-owned public bank that is under the supervision of the Ministry of Finance, or by the Secretariat of Fiscal Monitoring, Energy and Lottery, depending on the company’s activities. XII – linking to events and commemorative dates, as sports championships, Mother’s day, Christmas, Valentine’s day, Father’s day, Children’s day, Anniversary of State, Municipality, or the Federal District and other similar hypotheses. III – restricted to the sponsor’s or third party’s clients. As a rule, gambling has been prohibited in Brazil since 1946, when the last casino permits were cancelled. A number of scholars believe the gambling prohibition in Brazil was a reaction to the industrialisation of the country, because of the need to make free men dedicate their time to work and not to leisure. This, together with the religious belief that ‘in the sweat of thy face shalt thou eat bread’, caused gambling to be seen as something negative. However, this belief is no longer socially widespread in Brazil. There is, however, a general perception that gambling activities in Brazil are a cover for money laundering, and that gambling activities are operated by criminal organisations. This derives from the fact that, despite the general prohibition currently in place, bingo halls, slot machines and Jogo do Bicho can be easily accessed in Brazil. Poker and other games of skill, as well as social games, can be operated by private entities. These activities do not require any specific licence. Horse race wagering is restricted to non-profit entities that own the racetracks, duly authorised by the Ministry of Agriculture, Livestock and Food Supply. These entities may appoint agents to facilitate wagering on their behalf, and can also hire private suppliers, which are not subject to licensing or any specific regulation. Lotteries can only be state-owned. Caixa was granted the control of the federal lottery as result of Decree No. 50,954 of 14 July 1961, which cancelled all lottery licences granted to the private sector. p Loteria do Estado do Mato Grosso – Lemat. Federal and state lottery operators (i.e., Caixa and the state’s equivalent entities) may contract suppliers by means of public procurement. There is not any specific licence requirement for these suppliers. The federal government is in the process of organising the public bid for privatisation of instantaneous lotteries (sweepstakes). In 2009, however, when faced by a claim that the State Lottery of Rio de Janeiro’s expansion towards keno-style gaming was unconstitutional,8 one judge from the same Supreme Court declared that state lottery regulations enacted before Binding Decision No. 2 of 6 June 2007 are valid. A legal loophole currently allows offshore operators to offer their gambling products to Brazilian citizens. One of the general rules about contracts in the Brazilian Law is that a contract by and between absent parties is deemed executed in the place of the proponent. This is set forth by Article 9, Paragraph 2 of the Law of Introduction to the Brazilian Rules of Law (Decree-Law No. 4,657 of 4 September 1942) and repeated in Article 435 of the Brazilian Civil Code. As a consequence, if an offshore operator’s website is hosted in another jurisdiction where gambling is authorised, the contract between the Brazilian client and that operator is valid and subject to the operator’s jurisdiction’s law. This has some legal consequences in Brazil regarding consumer protection laws and money evasion, the latter with potential criminal aspects. So far, however, there have not been any attempts by the Brazilian government to bring any action against foreign operators. According to the Criminal Contravention Act, games of chance are prohibited in Brazil. Any form of gambling activity that has not been expressly legally authorised may be considered illegal under the scope of the Act and, therefore, anyone carrying out such an activity may be prosecuted. Decree Law No. 50,954 of 14 July 1961 establishes Caixa’s monopoly on lotteries, and Law No. 7,291 of 19 December 1984 and Decree Law No. 96,993 of 17 October 1988 regulate horse race betting. The Secretariat of Fiscal Monitoring, Energy and Lottery of the Ministry of Finance is in charge or regulating lottery activities in Brazil. State lotteries must comply with the gaming standards set forth by the Secretariat, and may not create new gaming products. The Ministry of Agriculture, Livestock and Food Supply is the entity responsible for the regulation of horse racing. Poker, recognised as a sport by the Ministry of Sports, is not regulated. Neither are social games nor any other kind of games of skill. The free distribution of prizes is regulated by the Ministry of Finance and is subject to previous authorisation by Caixa or by the Secretariat, depending on the operator. There is not any distinction between online gambling and bricks-and-mortar gambling for horse racing, provided that the general wagering plan expressly states the possibility of both. For the lotteries, Caixa does not allow their points of sale to accept remote bets. Land-based gambling in Brazil is restricted. Caixa has licensed over 13,000 lottery points of sale that are privately operated with permission (small venues that also operate as bank assistants, accepting payments of general services bills). Jockey clubs have their own agencies and agents (around 200), that are authorised to accept wagers on local and international races. Poker has become very popular in Brazil and there are many poker clubs open in the largest cities. Brazil’s federal legislation does not contain any provision related to online gambling, specifically. Horse racing entities already offer bets online in Brazil and Caixa only offers online betting for their account holders. The majority of the remote gambling activities in Brazil involve offshore operators, mainly sports betting and bingo. The application for a horse racing gambling licence should be made before the Ministry of Agriculture. The applicant must be a non-profit entity legally incorporated in Brazil, in ownership of a racetrack, and also needs to demonstrate the technical and economic viability of the weekly racing schedule and the floor plan of the race field. That entity must present the draft of a general betting plan (which includes the rules applicable for each game to be run by the operator, such as prize, ticket value, minimum and maximum betting amounts, and payout). Horse racing entities must also apply for their agents’ licences before the Ministry of Agriculture, Livestock and Food Supply. This application must be made by the authorised horse race entity, which must be entirely responsible for any and all acts of the agent. The agent licence is granted to the agent (person or company) to facilitate wagering only at the specified venue. Horse racing personnel and suppliers do not need to apply for licences and are not regulated. Both authorisations, for the horse racing entities and their agents, are valid without any time limitation. Revocation may occur when there is a non-observance of rules and procedures after the due administrative process. Article 50 of the Misdemeanour Law establishes that the operation of games of chance in a public place or in a place available to the public is subject to imprisonment, from three months up to one year, and a fine. In addition, introducing foreign lotteries in Brazil with the objective of sale, results in a penalty of a prison term of between four months and one year, and a fine (Article 52). Taking part as a player in illegal gambling may result in a fine. As Article 50 of the Misdemeanour Law has been recently amended by Law No. 13,155 of 4 August 2015, it is now the case that players and affiliates involved with online or offline illegal gambling are subject to a fine ranging between 2,000 reais and 200,000 reais. The penalty for advertising unlicensed lotteries is a fine. According to Article 50 of the Advertising Self-Regulation Code of the National Council for Advertising Self-Regulation (CONAR), any advertising that ‘induces to criminal or illegal activities’ is subject to penalties that may include a warning, a recommendation to modify the advertisement and a recommendation to suspend it. Those who operate international payments to offshore gaming companies without the due reporting to the Brazilian Central Bank (and consequent payment of taxes) may also be held liable for unreported remittance of funds, according to Article 22 of Law No. 7,492 of 16 June 1986, subject to imprisonment from two to six years and a fine, plus the payment of all due taxes. The Brazilian Civil Code classifies bets as contracts, therefore only those over 18 years of age are legally allowed to gamble. This is also set forth in the Brazilian Child and Adolescent Protection Statute, which rules that venues where billiards and snooker are played, and venues where bets are made, should not permit children and teenagers to enter. 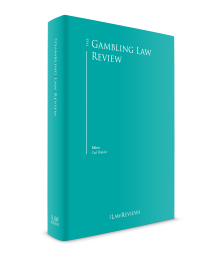 Although they are not specially aimed at gambling activities, general advertising rules in Brazil that may have an impact on gambling are included in Decree-Law No. 57,690 of 1 February 1966 and Decree-Law No. 4,563 of 31 December 2002, and anti-money laundering rules in Law No. 9,613 of 3 March 1998 and Law No. 12,846 of 1 August 2013. Concealment or dissimulation of the nature, origin, location, availability, handling or ownership of assets, rights or valuables directly or indirectly originated from criminal activities. According to Article 10 of the same law, all companies that pay prizes are obligated to identify their clients and keep records for at least five years. Brazil has been a member of the Financial Action Task Force since 2000. It has also been a member of the Financial Action Task Force of South America since 2000. Law No. 12,846/2013 is the anti-corruption law in Brazil, which focuses on companies (either Brazilian or foreign) with operations in Brazil. This law created civil and administrative responsibilities, as well as criminal responsibilities, and may be compared to the UK Bribery Act. Lotteries are not taxed, since they are owned and operated by the state. Their revenues, however, have pre-established social destinations set forth by law, such as funds for sports, education, health, culture, etc. Jockey clubs, as non-profit entities, pay the ordinary corporate taxes (with exception to the taxes on income), and the contribution to the Coordination Commission for National Horse Breeding of 1.5 per cent of the adjusted net win (wagers minus prizes for winning bets minus prizes for horsemen). The gamblers are also taxed. As per Article 676 of Decree Law No. 3,000 of 26 March 1999, all prizes paid for lottery and horse racing winnings are subject to an exclusive withholding income tax of 30 per cent of the prize amount. Poker prizes, on the other hand, are subject to a different income tax withholding. If there is a labour relationship between the winner and the legal entity promoting the event, or if the winner is not resident in Brazil, the income tax to be withheld is 25 per cent. If there is not any employment bond and the winner is resident in Brazil, the withholding tax will be 15 per cent. Article 57 of the Misdemeanour Law expressly rules that publishing, even if indirectly, the operation or results of unauthorised lotteries in newspapers, radio or any other format is a contravention, punishable by a fine. As to other forms of gambling, there is no express reference to advertising restrictions in the criminal law. Decree-Law No. 57,690 of 1 February 1966 and Decree-Law No. 4,563 of 31 December 2002 regulate advertising in Brazil and, according to the latter, all advertisement in Brazil must comply with the rules set forth by the Standard Rules Executive Council (CENP).9 This council is responsible for regulating the commercial relations between advertisers and agencies, while CONAR is responsible for ensuring ethics in advertising content. Both CENP and CONAR are non-governmental organisations formed by members of the advertising industry to define their own statutes and codes. CONAR’s Self-Regulation Code also includes a general rule that advertisements should not contain anything that ‘induces criminal or illegal activities’ (Article 21). Based on this general rule, many gaming and poker companies have faced difficulties trying to advertise in Brazil. In 2009, CONAR prohibited Full Tilt Poker from advertising on the Discovery Channel. That decision was based on the assumption that poker was a game of chance, illegal in Brazil. After deliberation, CONAR decided that poker is a game of skill, and allowed its advertising. In that same year, CONAR also prohibited Sportingbet from advertising in Brazil. This prohibition was upheld by the Brazilian courts after it was challenged by Sportingbet. As a rule, there has not been any restriction for advertising social gaming websites (the ‘.nets’), since their activity is legal in Brazil. As far as the regulation of gaming in Brazil is concerned, 2015 was probably the busiest year for over a decade, since the shutdown of the industry in 2004. 2016, on the other hand, was a great disappointment. After five months of lengthy discussions, Law No. 13,155 was approved on 4 August 2015 by Congress, authorising the operation of fixed-odds sports betting (run by Caixa) by licensed horse racing entities and by licensed private companies. Despite the veto, and mainly because of Brazil’s pressing need to find additional sources of revenue for the government, the President held a meeting with a number of Congress leaders on 14 September 2015 in order to assess if, from a political standpoint, gaming regulation could be reconsidered and made viable. This meeting was widely published in the media and the result was surprisingly positive. As a result, the government communicated its openness to regulate the gaming industry to Congress, which started working on the basis of pre-existing bills of law on the matter. On 30 September 2015, the President of the Senate, Renan Calheiros, included Bill of Law 186/2014,10 drafted by Senator Ciro Nogueira, among the topics discussed by the Special Commission for National Development (CEDN), which led to a fast-track procedure to obtain approval for strategic bills, which are needed for the overall improvement of the economy (the ‘Agenda Brazil’). On 28 October 2015, the Chamber of Deputies created another Special Commission to draft the Brazilian Gaming Regulatory Framework. Since then, the Commission has been holding weekly meetings and hearings. On 9 December 2015, the CEDN Commission approved the substitutive bill of law presented by Senator Blairo Maggi and on 10 March 2016 the Bill of Law received five new amendments, which means it can be voted on in the Senate. After extensive discussion, on 30 August 2016, the Commission of the Deputies approved the report on the new draft of Bill 442/1991, which was sent to the Chamber of Deputies’ plenary to be scheduled for vote. Also, in August, Bill of Law 186/2014 was returned to the Senate and its draft was replaced by a new version, presented by Senator Fernando Bezerra, its new rapporteur. Senator Fernando Bezerra presented several versions of the draft, the latest on 4 November 2016. On 9 November, the Commission of the Senate finally approved Bill of Law 186/14, and on 14 December a request from Senator Magno Malta was approved. On 13 December 2016, several experts were invited to speak at the General Commission of the Chamber of Deputies about gaming regulation. Bill of Law 186/2014 was rejected by the Justice and Constitution Commission on 7 March 2018 by a vast majority of 13 against it and only two senators in favour (the rapporteur and Senator Ivo Cassol). With such a defeat, the Bill is unlikely to be presented at the plenary for vote. In this sense, the President of the Senate has already spoken that he will not schedule the Bill for vote this year. In the state of Rio Grande do Sul, in the south of Brazil, a court decision has stated that gambling is not prohibited in that state because the prohibition set out in Article 50 of the Misdemeanor Act of 1941 would be unconstitutional. The public attorney has appealed that decision and now the case is pending judgment by the Federal Supreme Court,11 where it has been granted ‘general repercussion’ effects, which means that the decision of this case will be binding to all other similar cases in the country. Until the judgment is released, the effects of the prior decision from the Rio Grande do Sul court remain in force. As a result, many bingo halls are opening in the state, without any regulation. This lack of regulation may result in political pressure on the state, but depending on how the operators behave, it may create the opposite effect. Once a bill of law is approved in the floor of one of the houses, it will have to be approved by the other house. If amended, it will need approval by the house of origin before being subject to the President’s sanction. We do not expect this process to be completed until the end of 2018. This delay is a consequence of the unprecedented political crisis that has arisen from the corruption scandals involving several important politicians, including the former and the current presidents. The current President, Michel Temer, was trying to push the social security, labour and tax reforms for legislative approval in 2017 and the gaming bill was supposed to be voted only after that. Now, because of the presidential and congress elections in the second semester of 2018, it is very unlikely that regulation will be approved this year. There is room, however, for casinos and sports betting regulations. The first is part of the tourism regulation, which is currently under discussion, and the latter as a Bill of Law from the government in the second semester, once the LOTEX tender is over. Lotex, an instant lottery, was created by Law No. 13,155 of 4 August 2015, and Law No. 13,262 of 22 March 2016 redefined the object of Lotex to include events of great popular appeal, commemorative dates, cultural references, licensing of brands or characters, and other graphic and visual elements in order to increase its commercial appeal. This change was significant and represents a major advance for instant lotteries in Brazil. In Brazil, an instant lottery is limited to the so-called ‘scratch card’ sector. However, instant lotteries encompass various types of games and bets that are common in other countries, but non-existent in Brazil. The aim of the government is to encourage these other modalities that are still unexplored, in order to further increase the profitability of this economic activity. The first step for the privatisation of Lotex was the issuance of Law No. 13,262 of 22 March 2016, which authorised Caixa Econômica Federal to set up Caixa Instantânea S/A, a wholly owned subsidiary, to manage and operate Lotex throughout the country. The Secretariat for Economic Monitoring of the Ministry of Finance believes that the concession will expand competition, as well as modernise and improve the lottery market in Brazil. Turnover from ticket sales would be split into three: (1) 65 per cent for payout; (2) 18.3 per cent for the concessionaire; and (3) 16.7 per cent for the federal government. The concession term will be for 15 years and the minimum bid for the right to operate LOTEX will be 542.215 million reais. The contract total value is estimated as approximately 14.43 billion reais. The privatisation project has been monitored by the Federal Audit Court (TCU). In the first phase of the process, the TCU approved the economic and financial model under Award 514/2018, dated 14 March 2018. The next phase shall commence after the invitation to bid is made public. A draft of the invitation to bid was submitted to public evaluation between September and October 2017. The definitive version of the invitation to bid was published on 4 April 2018. The tender of LOTEX will be an auction, being the winner determined by the highest bid, which shall be paid to the Ministry of Finance. As per the invitation to bid, the participation in the auction is open to Brazilian or foreign legal entities, solely or jointly in consortiums, collective investment entities and investment funds. It is strictly forbidden that any legal entity (and its related or affiliated companies, companies under its control and companies under common control) to be a member of more than one consortium. The bidders will be required to submit the tender guarantee, the qualification documents and the bid proposal (in written form) on a certain date, which will be set in the invitation to tender. All documents must be submitted by an accredited agent that has a power of attorney to represent the bidder. One must also note that the bidder shall submit two copies of each document, as well as three flash drives containing each document. As concerns the tender guarantee, it can be granted in cash, Brazilian government bonds, performance bonds or bank guarantees. In the event that the bidder is a consortium, the required tender guarantee value is increased by 30 per cent. The written offers for the bid will be disclosed during a public hearing, which shall take place on 14 June 2018 at 10am. The ranking of the bidders shall be published online on the same day and the result will be published on 17 August 2018. 1 Luiz Felipe Maia is founding partner at FYMSA Advogados. 2 Brazilian Institute of Geography and Statistics. Projection of the population of Brazil and Federative Units. Accessed on 4 April 2017. Available at www.ibge.gov.br/apps/populacao/projecao. 3 World Economic Forum. The world’s 10 biggest economies in 2017. Accessed on 4 April 2017. Available at www.weforum.org/agenda/2017/03/worlds-biggest-economies-in-2017. 4 Luiz da Cunha Gonçalves, Tratado de Direito Civil, Volume 8, Tomo I, São Paulo, Max Limonad (1956) p. 380. 5 Clóvis Beviláqua, Direito das Obrigações, third edition (1931). 6 Pablo Stolze Gagliano and Rodolfo Pamplona Filho, Novo Curso de Direito Civil, Volume 4, São Paulo, Saraiva (2012), pp. 597–598. 7 Humberto José da Nova, ‘Comentários à Lei das Contravenções Penais. Das contravenções relativas à polícia de costumes’, Anais do 1º Congresso Nacional do Ministério Público, Volume 6. Rio de Janeiro, Imprensa Nacional, (1943), p. 149. 8 Rcl 9134 – Rio de Janeiro, Federal Supreme Court, Min. Ellen Gracie. Judgment dated 15 February 2009. Accessed on 7 April 2017. Available at www.stf.jus.br/portal/processo/verProcessoAndamento.asp?numero=9134&classe=Rcl&codigoClasse=0&origem=JUR&recurso=0&tipoJulgamento=M. 9 CENP, Standard Norms for Advertising Activities, São Paulo, 16 December 1998. Accessed on 7 April 2017. Available on www.cenp.com.br/PDF/NomasPadrao/Normas_Padrao_Ing.pdf. 10 Federal Senate, Legislative Activity. Bill of Law No. 186 of 2014. Accessed on 7 April 2017. Available at www25.senado.leg.br/web/atividade/materias/-/materia/117805. 11 Extraordinary Appeal 966.177 RG/RS.